There is still plenty of time left to find something sweet for your sweetheart for Valentine’s Day! How about this adorable neclace from from Etsy seller, The Wicked Shop. It comes to us from Canada for only $9.20. This pendant started out as a plain ole Scrabble tile, but The Wicked Shop turned it into something special. Someone please let me honey know that I would love to receive this next week! My family and I are busy planning our next trip to Disney World and when I saw this on Etsy today, I had to share. It is cute, sweet and petite and I love it! 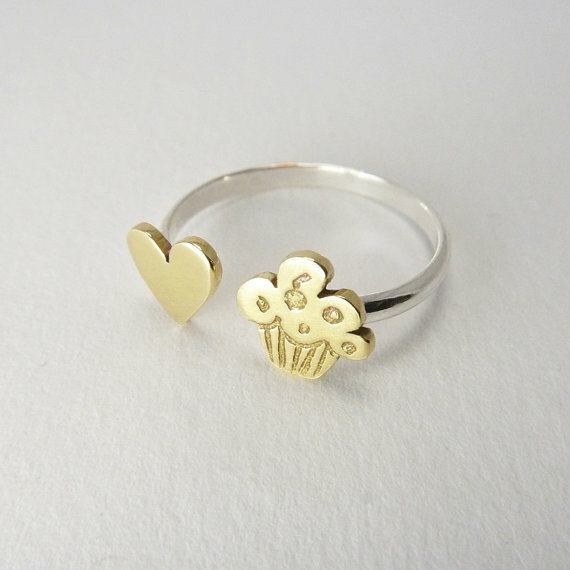 It brings together three of my loves too- Disney, cupcakes and jewelry. 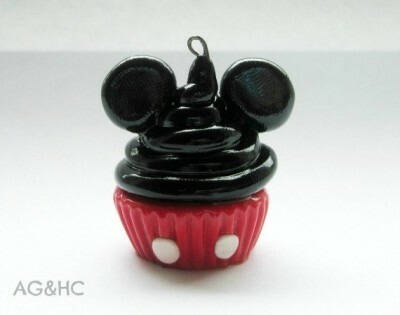 For only $8 from A Girl and Her Clay, this handmade polymer clay Mickey Mouse cupcake is a great deal! So I’m a little behind of the latest bracelet trend. I had no idea Alex and Ani charm bangles were popular until one arrived in my mailbox. I was sent a little care pacakge that included the Alex and Ani cupcake bangle. I really like the bracelet because it’s simple, although from what I understand you’re supposed to layer the bracelets, each of which have different charms. 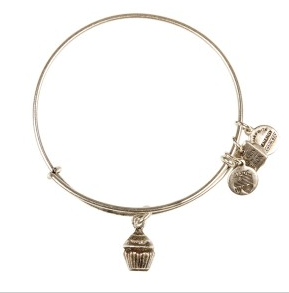 The cupcake bangle is available for $28.00 in gold or silver from the company website which has tons of different charms available including some colleges which is a fun christmas or December graduation gift idea! 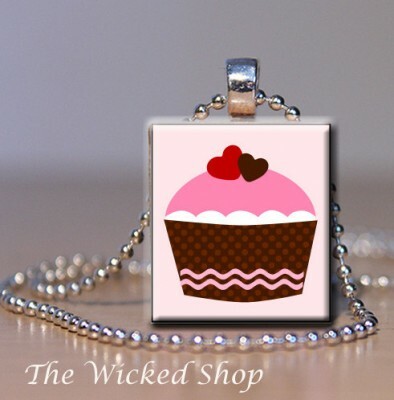 Over the past few weeks I have shared with you some of my favorite cupcake jewelry finds. I’ve shared a cool bracelet and a sweet pendant and this week I am moving onto rings! It was way to tough to just pick one so here are two fabulous finds. This unique silver & brass ring is from Etsy seller Angela Gomez Jewelry and is a great price at $28. 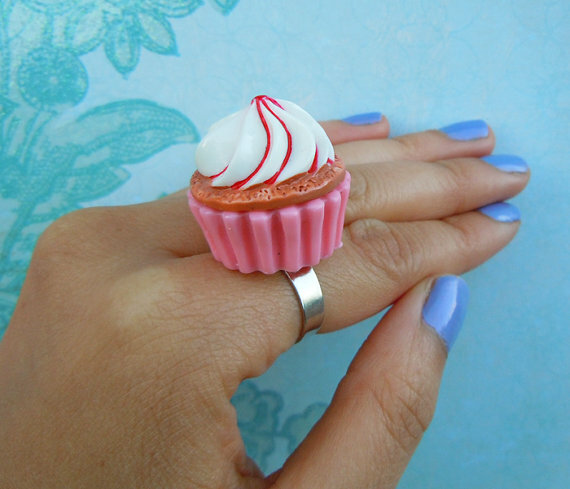 I am also loving this pretty and yes a bit kitschy cupcake ring from Kelsea Echo Studios. It is a steal at $7.50! And as icing on the cake (pun intended) they are donating 100% of their revenue to the American Heart Association until October 19th. Two very sweet rings! 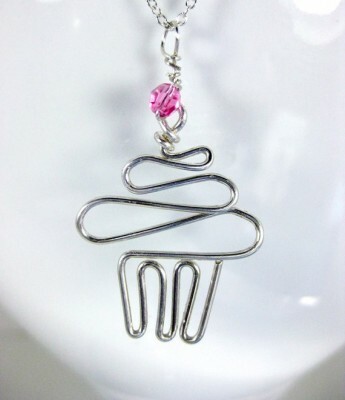 Earlier this week I shared with you my favorite silver cupcake necklace I found on Etsy. 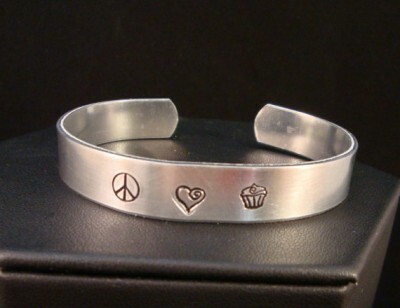 Well, now I am in love with this peace, love and cupcakes cuff made by crafter CrowStealsFire. It is cool and sweet at the same time and at only $22, it is a great price too! And with over 300 amazing and beautiful jewelry items in their shop, I may have to purchase more than one piece! I am such a sucker for sterling silver. Earrings, bracelets, rings, charms and, of course, necklaces! My most recent favorite silver find is the perfectly sweet handmade pendant from Etsy seller, Jodi Spade. I just adore the pink Swarovski crystal cherry on top! It is $38 and comes with an 18″ chain. Make sure to check back here to ATC this week for my fav bracelet find too! Check out this beautiful new Cupcakes and Tea Charm Bracelet from Lottie of London. Clare Lewis is a jewelry designer from South London. All of her jewelry is handcrafted using polymer clay.